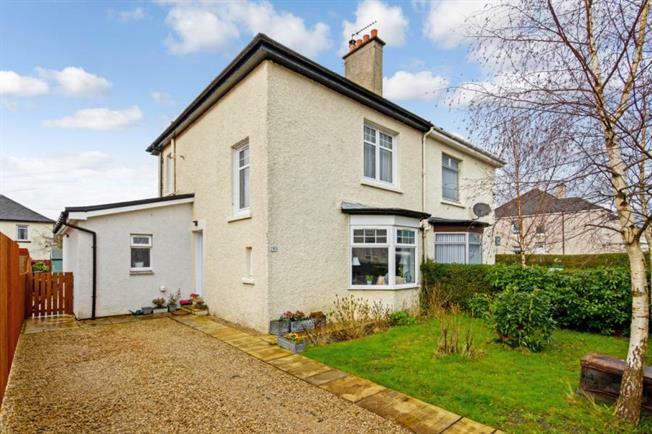 3 Bedroom Semi Detached House For Sale in Glasgow for Offers Over £189,000. This beautifully presented extended semi detached villa is located in a popular Knightswood address and offers bright, well proportioned and versatile layout of accommodation. Comprising: reception hall, spacious lounge with a feature ' Morso' multi fuel stove, a fabulous extended family room which is open plan to a quality fitted kitchen. There is a super downstairs double bedroom with built in storage and an en-suite shower room. The upper floor offers two double bedrooms and a family bathroom. A large utility room completes the accommodation. The home is warmed by gas central heating and has double glazed windows. To the outside there are beautifully tended gardens which to the rear enjoy excellent privacy and have well stocked borders, patio and summer house. A driveway provides ample off street parking. property offers a popular and convenient locale well placed for local amenities including many shops and good public transport links via bus and rail. Furthermore the property is also well placed for main road links via the Clyde Tunnel, Clydeside Expressway and M8 motorway network providing access to destinations further afield.